I am so excited to be using my friend's new stamp line! Her launch date is November 1st but she gave me the thumbs up to go ahead and start using them:-) I have been playing with her three new sets and backgrounds for awhile and am so ready to start showing them off! I used one of her birds for this weeks Authentique's sketch challenge. Her Birdhouse set works perfectly with Authentique's Lively card stock stack. 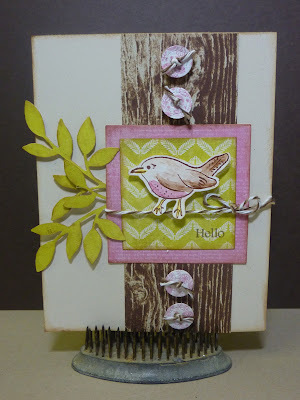 I stamped the image with Ranger Sepia Archival Ink and water colored the bird with water color crayons. The leaf die cut is from Stampin' Up as well as the button die. If you are interested in viewing or even purchasing these brand new photopolymer stamp sets, please visit Mary at Iron Gate Stamps or her blog at Mary-Just Cut The Paper. Very nice...new stamp companies are always fun!